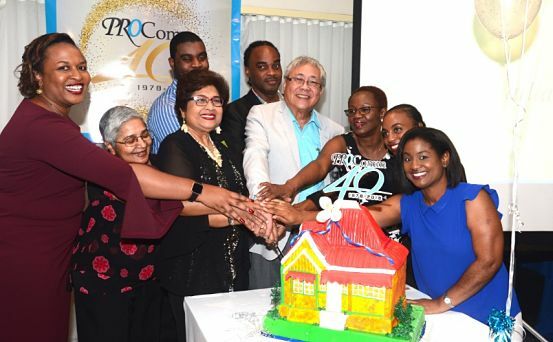 FEELING FESTIVE: The ProComm team shares in the cutting of the cake; (below) Lowrie-Chin, with Christelle Harris and Ruth Hussey. 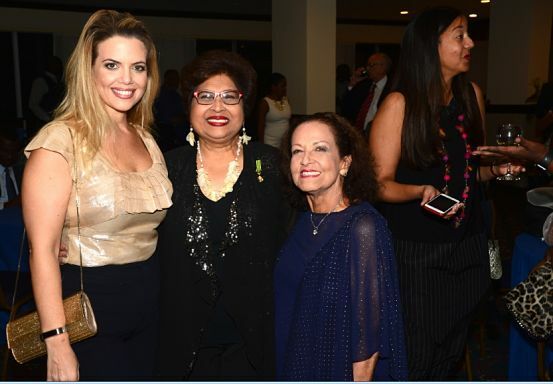 Enchanted Evening: As the room filled to capacity with well-dressed folks and the wait staff began serving bubbly and bites, compere Tony Lowrie invited Archbishop Kenneth Richards to bless the evening’s proceedings. Memory Lane: Who knew that lady of the hour Jean Lowrie-Chin (looking stunning in black) signed her first ProComm contract with the Pegasus exactly 40 years ago (on Nov. 29, the same date as this event)? Or that she presented the very first ProComm scholarship (she’s big on education) to Calabar old boy Etmore Williams, who lived in Grant’s Pen at the time, and went on to become a sales and marketing manager?